64 pages of puzzles and Bible engagement which looks at the Easter story in a fun and different way - spot the difference, codes, word search, odd one out plus lots of additional information. A great Easter gift for parents, grandparents or god parents to get for the children which they may know. Ideal for those long journeys visiting family over the Easter period. This fun book is a great resource for church children's group leaders to use over the Easter season. 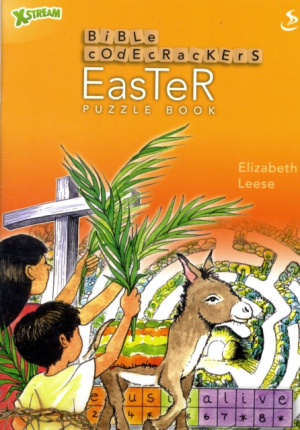 Bible Codecrackers Easter by Elizabeth Leese was published by Scripture Union in January 2009 and is our 820th best seller. The ISBN for Bible Codecrackers Easter is 9781844273539. The latest in the Bible Codecrackers series, this little book, will keep a youngster busy for hours! Packed with things to do and all the while learning more about Jesus and the story of Easter in particular. Really imaginative activities, not just the usual crosswords and wordsearches, there are things to do here that are certainly new to me. Plenty to read too, they will need a Bible to refer to, and before they begin should read the ‘Advice for all codecrackers’ at the beginning. Got a question? No problem! Just click here to ask us about Bible Codecrackers Easter. What age is this book aimed at please. A:This is suitable for ages 8-11. Thank you for using the Q&A Forum.